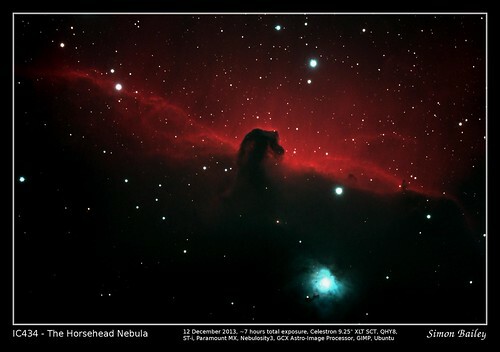 High resolution TIF of the Horsehead Nebula. Taken over ~6 hours of exposure using a Celestron 9.25″ XLT coated SCT with an F6.3 focal reducer attached using a QHY8. Focused manually (not easy! ), mounted on a Paramount MX, guided using sn SBIG ST-i colour and an off-axis guider. Filters used were a CLS (not the CCD version unfortunately) and a UV/IR blocker. 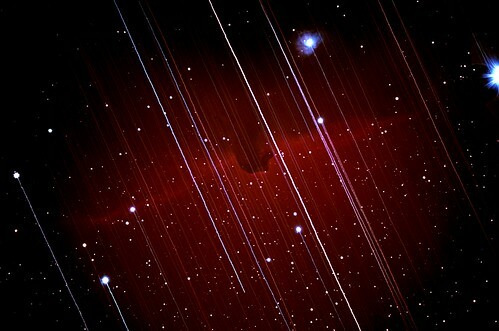 Captured using Nebulosity 3 on a Windows 7 PC, post processing on Ubuntu using Nebulosity 3, GIMP and GCX Astro-Image Processor.